Only 4 left! This item ships in 1-2 days. New Baby Engraved Train Bank - Engraved New Baby Gift ideas. Choo! Choo! goes the engine & Cha-Ching! goes the money right inside this adorable, Engraved New Baby Train Bank. Our Engraved Train Bank makes a unique gift idea for children or for a kid's birthday gift. We also suggest giving this personalized gift as a ring bearer gift with name and wedding date. Our Engraved New Baby Silver Train Bank measures 6" L x 2" x 3¼" H and is beautifully crafted to look like a real engine with a silver pewter finish. 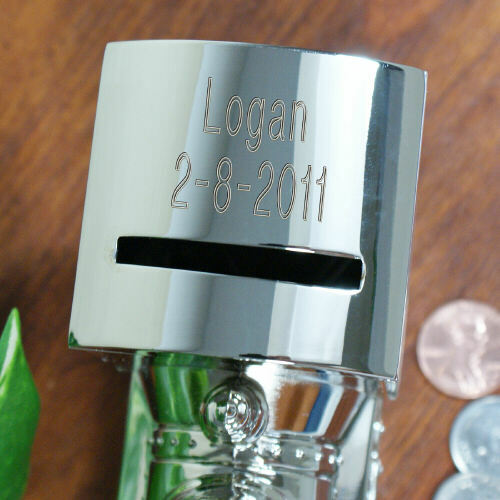 Every Engraved Baby Bank includes FREE personalization! 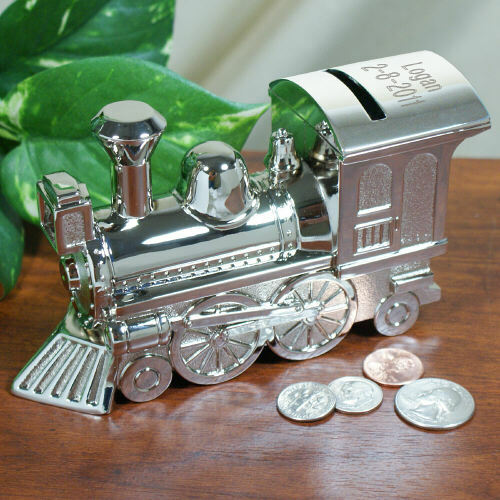 Personalize your New Baby Silver Train Bank with any name and birth date. Shop Baby Keepsakes today! I bought this two years ago and it was well received so when the time came for the next baby, I bought another. Now this is an awesome product. I wish it were less expansive, but it feels like it SHOULD be more expensive. Solid and heavy and just awesome. Engraved gift ideas for the new baby. Our engraved bank makes a unique gift idea for newborn babies & children. Also makes a unique engraved keepsake for kids. We also have a complete selection of Personalized Baby Keepsakes suitable for your most treasured baby boy or girl.